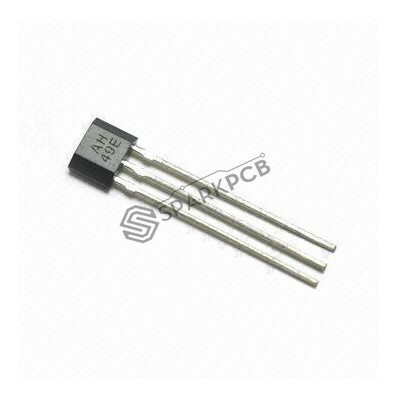 Minimum quantity for "Hall Effect Sensor (AH Series)" is 1. The Allegro A1101-A1104 and A1106 Hall effect switches are next generation replacements for the popular Allegro 312x and 314x lines of unipolar switches. The A110x family, produced with BiCMOS technology, consists of devices that feature fast power-on time and low-noise operation. Device programming is performed after packaging, to ensure increased switchpoint accuracy by eliminating offsets that can be induced by package stress. Unique Hall element geometries and low-offset amplifiers help to minimize noise and to reduce the residual offset voltage normally caused by device overmolding, temperature excursions, and thermal stress. 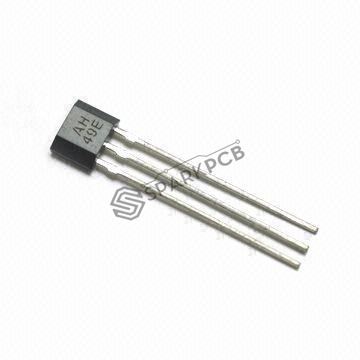 The A1101-A1104 and A1106 Hall effect switches include the following on a single silicon chip: voltage regulator, Hall voltage generator, small-signal amplifier, Schmitt trigger, and NMOS output transistor. The integrated voltage regulator permits operation from 3.8 to 24 V. The extensive on-board protection circuitry makes possible a ±30 V absolute maximum voltage rating for superior protection in automotive and industrial motor commutation applications, without adding external components. All devices in the family are identical except for magnetic switchpoint levels.